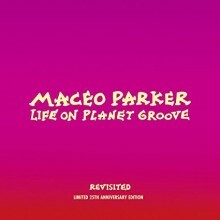 “Gather round, space cadets and funkateers.” So begins the liner notes for Maceo Parker’s seminal 1992 live album and funk opus, Life on Planet Groove. In honor of the 25th anniversary of the album, Minor Music has released Life on Planet Groove Revisited, which also coincides with Parker’s 75th birthday. This limited edition set includes a new analog to digital transfer of the original album, a second bonus disc, and the DVD Maceo Blow Your Horn. As everyone likely knows, Maceo Parker was a key member of James Brown’s band in the 1960s, blasting out funky sax solos whenever JB shouted, “Maceo! Blow your horn!” Parker famously walked out on Brown in 1970 with other members of the band, who were replaced by a youthful Cincinnati led group by Bootsy and Catfish Collins. Like Bootsy, Maceo would later join up with George Clinton and contribute to various P-funk projects. Though Parker would return to Brown’s band for a few years, he struck out on his own in 1990. Soon thereafter, he wound up at a club called the Stadtgarten in Cologne, Germany, where Life on Planet Groove was recorded. His backing musicians for this performance included Fred Wesley (trombone, vocals), Pee Wee Ellis (tenor saxophone, flute, vocals), Rodney Jones (guitar), Larry Goldings (organ), and Kenwood Dennard (drums). Special guests included Vincent Henry (bass and occasional alto-sax), Prince protégé Candy Dulfer (alto), and Kym Mazelle (vocalist). Also included is the DVD Maceo Blow Your Horn, featuring newly released footage filmed by Markus Gruber during recording sessions for Parker’s album Roots Revisited, which topped the jazz charts in 1990. Most of the footage was meant for promotional purposes only and is black and white, but the sound is decent. The camera follows band members as they jam in rehearsal and lay down tracks at studios in New York (November 1989) and Cologne (1990). These clips are interspersed with interviews where Parker discusses the creative process along with anecdotes about James Brown, Fred Wesley, Pee Wee Ellis, Curtis Mayfield, George Clinton, Bootsy Collins, and Ray Charles, among others. Along the way there’s some odd filler footage of airplane wings and cityscapes. Just to be clear, this is not a documentary in the manner of My First Name Is Maceo, but rather bits and pieces of footage strung together with title cards. Regardless, the film is certainly of historical interest and any fan of Maceo Parker and his band will be grateful for its inclusion. 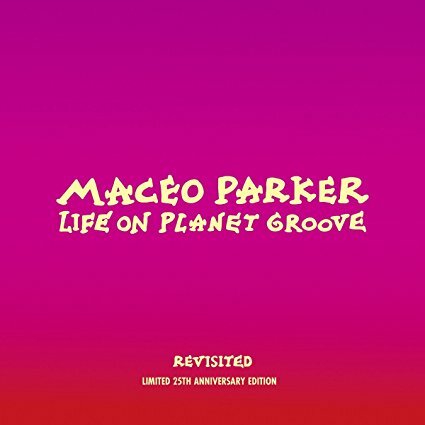 Life on Planet Groove Revisited is a fine tribute to the great Maceo Parker on his 75th birthday.